BASS: Good evening, ladies and gentlemen. My name is Warren Bass. Welcome to tonight’s meeting of the Council on Foreign Relations on the global rise of anti-Semitism. As Dickens says, “It was the best of times, it was the worst of times.” On the one hand American Jews are so well-integrated that they can serve at the highest levels of the White House and the State Department. I see Martin Indyk is with us. We have a number of major presidential candidates who are Jewish, including Bernie Sanders and Howard Schultz, and it barely rates a mention. On the other hand there are troubling new cross-currents that are part of what bring us here tonight, and we have recently seen in Pittsburgh the worst anti-Semitic massacre in the history of the United States. BASS: —is Laurie Goodstein. Most of you will know her byline from her wonderful pieces in the New York Times as their longstanding national religion correspondent. She is now deputy international editor at the Times. Sitting next to her is Jonathan Greenblatt, who since July 2015 has been the CEO of the Anti-Defamation League, one of the country’s key civil rights organizations. You served previously as special assistant to President Obama and director of the White House Office of Social Innovation. Let me start with a question focused mostly on the domestic side, which is just a fairly simple-minded one, which is to say—and I’ll throw it open, perhaps, to Laurie and Rebecca first—how bad is it today, either in the context of recent coverage that you’ve done, Laurie, for the Times, or Rebecca in the somewhat longer sweep of American Jewish and American history? BASS: Sure. Slightly shorter for you, a little longer for Rebecca. GOODSTEIN: OK. All right. Yeah. The answer is it’s bad. I had a discussion with Heidi Beirich at the Southern Poverty Law Center, who’s been monitoring hate groups for—since 2000, and she said to me the—not only the amount of anti-Semitism, but the virulence of anti-Semitism that she’s been monitoring is worse than she’s ever seen it in terms of the proliferation of organizations and also the factor of the internet. I know as a writer with an identifiably Jewish surname that anti-Semitism has always been out there. I have always received communications that are anti-Semitic. It used to come in mail, snail mail, and then it came by email. But now it comes over social media. And not only just the kind of shower of—that you’re subjected to, you know, but also the fact that it is different in that it’s public. It’s also interactive. This is a two-way communication, as opposed to just opening a letter. Everybody can see it. It’s public. And people can respond to it, and people can use it to find one another. And so this is sort of a—you know, this is a factor that is seeding this and making—probably making the situation much, much worse in that it’s really a free for all. BASS: Rebecca, how does this look in historical sweep? KOBRIN: So I would say that presently we are in—it’s unprecedented in the last half-century, the amount of I would say violent anti-Semitism both in action and in social media. But I think from the longer perspective—and if we think about it, 2019 is the eightieth anniversary of 1939, which I call the year of the Jewish refugee, in which Jewish refugees, particularly from Germany, are seeking places to go. And I think it’s important for us to be thinking about anti-Semitism from the bottom up, which is what we’re experiencing now; and from the top down, from the government down, because much of what happens in 1939 is Jewish refugees cannot come into the United States. And February is the anniversary of the failed Wagner-Rogers bill to let in children from Germany like the Kindertransport, and they are not let in because they are feared what they are going to do to America. So I would say that from the top down anti-Semitism is in a much better place than it was eight years ago, but from the bottom up there is a resurgence which I would say has not been experienced in the last at least half-century. BASS: Jonathan, we’ve mentioned the internet briefly there. Is that one of the key drivers for what’s making the situation so much more poisonous right now? GREENBLATT: I think certainly by almost any measure the internet has transformed society, and the internet has broken down barriers, and the internet has become this remarkable playing field for so much positive change. But in the case of hate, it’s literally become a cesspool. I mean, we believe at the ADL that Facebook is the frontline in fighting hate. And while I think the technophiles in Silicon Valley—in full disclosure, I’m a refugee from California who worked in Silicon Valley for many years—I think with the best of intentions they built platforms like Facebook and Twitter and YouTube and Reddit and carved out this brave new world, and their libertarianism combined with a bit of kind of just oversight created the conditions in which extremists were able to exploit those mediums. And they’ve done it and spawned anti-Semitism at a kind of velocity and with a volume that we’ve never before seen at ADL. I mean, we’ve been at this work at ADL since 1913. And I agree with my colleagues, and particularly this point about the fact that in some ways it’s much better today than it’s ever been. I mean, to think we have a president in the White House with Jewish grandchildren in the residence, I mean, it’s remarkable. And yet, he is inexplicably incapable of calling out Nazis in the kind of clear and unambiguous way that he calls out, I don’t know, pop singers and NFL athletes and take your pick. So it’s a remarkable moment that we’re in, and anti-Semitism has become so mainstreamed. I mean, we see conspiracy theories like the horrific slander directed against George Soros is a really good example. George Soros is patient zero for the anti-Semites, and what they’ve done is used social media to normalize this kind of hate in ways that heretofore were impossible to imagine. And so what is so challenging and so paradoxical is we expect our leaders to lead; and yet the president, rather than calling this out—and other political figures, too, by the way, because we need leaders to lead on college campuses. We need leaders to lead in all political environments. But using these means and repeating this rhetoric creates conditions in which anti-Semitism has gone from being a bug in the system to a prevailing part of the social context. GREENBLATT: So is this like a multiple choice? Is that, A, Donald Trump’s last campaign commercial? B, Alex Jones’ latest rant on Infowars? (Laughter.) You know, or, C, David Duke’s—one of his speeches in Louisiana? GREENBLATT: The point is those three things are almost interchangeable, right? I mean, to think we’re living in a moment where this kind of language about Jewish bankers destroying our national sovereignty is literally something that’s being uttered by a serious political figure, let alone a presidential candidate who would then win, it’s the kind of stuff that’s right out of the pages of history, and it’s deeply terrifying. Now, that doesn’t mean that Donald Trump is an anti-Semite. Like I said, he has Jewish grandchildren. I don’t know what’s in his heart. I don’t know what’s in his head. But to use these words and to call out—to use this kind of language is very problematic. BASS: Let me just push you for one second. Is that language that I just quoted—is that problematic, or is that anti-Semitic? GREENBLATT: Anti-Semitic, straight up. I don’t want to be ambiguous. And we—that’s the reason why the ADL called it out during the campaign, and we were criticized for doing so. People said that we were being political, but there is nothing political in calling out prejudice. And whether you are a congresswoman from Minnesota, a freshman, or you are a presidential candidate on the other side of the aisle, I think at the ADL it’s our job to call out hate when it happens, no matter where it comes from. BASS: Rebecca, you were trying to get in there. KOBRIN: So I think it’s important for us to think about this paradox, because you mentioned it twice that he has Jewish grandchildren. And I think the notion of what it means to be racist—because anti-Semitism at its core is putting racist—putting a prejudiced vision of a certain people—this is what has been his stock in trade from the beginning. So I think that historically where we are in this moment is that we are seeing the rise of white supremacism, which we have not seen—I mean, I think it’s always been there below the surface, but it is taking new forms because of the internet. And I think that the apology that we’re always—and I should just say the last time I spoke at the Council on Foreign Relations there was a notion how—and this was in the beginning of a campaign—that Trump made a comment about how of course he’s going to have all the Jews in the Cabinet with the money because they’re good at it. And I was like, well, that’s anti-Semitic, we should be saying right away, and everyone laughed. But these are the type of things that we often are laughing, but they quickly transform into age-old stereotypes. And that’s what I think—what the ADL does, but thinking about how the notion of a personal family has been used to excuse certain statements which I would say clearly are anti-Semitic and have been there since the beginning of 2016. BASS: Laurie, let me turn to you for some global sense of where this phenomenon comes from because it is not just from the right today. You see the British Labour Party is being ripped apart over questions of anti-Semitism. There are violent attacks in France by Islamist extremists and others. Do you have some sense of what the proportions are of what this phenomenon looks like between right, left, Islamist, other causes? Anything you can do to help contextualize that? GOODSTEIN: Yeah, I don’t have a way to quantify it, but I would say that they’re all feeding each other. You know, it’s very interesting how Ilhan Omar—she’s one of the two new representatives who is Muslim, first Muslim women to be part of Congress. And some of her statements have shown up on the website of the Daily Stormer, which is, you know, a white supremacist website. So think of the irony there. This is not—you know, to your—to answer, quantifiable. But how these streams are feeding one another, it almost doesn’t matter, you know. Everybody is, you know, using one another as reference points to normalize—to normalize this. So I think that you could—you know, Jonathan just got back from Europe, but my sense is that also in Europe these streams are feeding one another. You have, you know, difficulty weeding out what is anti-Israeli and what is anti-Semitism, and those streams feeding one another. You have white supremacists. You have nationalist parties rising. And you have—you know, you have Muslim extremism. And those are all—you know, those are all in the air. But I don’t—you know, I don’t think that—I don’t know that it would be possible to quantify. GREENBLATT: Sure. I mean, well, I can give you some statistics. So, generally—so a couple thoughts. So, number one, I do think it is critical to underscore that neither side of the political spectrum is exempt from extremism, that neither political party has a monopoly on morality. This is not a right-or-left issue. This is an issue of right and wrong. And thinking even about the spectrum like in a linear two-dimensional way is the wrong way to think about it. It’s more like a horseshoe. There’s a French political theorist—someone here will know his name—who coined this idea because the extremes meet here. When I was literally in Germany just last week the head of the German Jewish community was telling me that they see the extreme right and the extreme left working together. And then I went to France, and the yellow vests protests have been to some degree maybe not hijacked, but there’s an element of real extremist elements in there. Again, they are Antifa types and real right-wing types. And so we shouldn’t kid ourself to think, oh, it’s them. I mean, it’s both. That being said, in the United States the ADL, again, we track anti-Semitic incidents. I’ll share that we saw a 57 percent increase in 2017. The 57 percent increase that we saw in 2017 was the largest surge that ADL has tracked in forty years of doing this work. That includes a 94 percent increase of acts at K through 12 schools and an 89 percent increase on colleges and universities. I haven’t even told you the 2018 numbers yet because we’re still finalizing them, but I can tell you that right now as we sit here this past weekend in Brooklyn there was yet another assault. This stuff isn’t happening in far-off places, guys. It’s happening right down the streets in Crown Heights, where visibly identified Jews are being assaulted, their houses of worship are being vandalized, and they are being harassed and intimidated in the streets. Now, I can’t tell you the political affiliation of all the culprits. But if you look at the worst kind of violence, in the United States there were fifty extremist-related murders in 2018. Forty-nine of those murders were committed by people who you could characterize as having extremist right-wing orientation: white supremacists, a group known as incels—which stands for involuntary celibates; they’re lovely people—(laughter)—anti-government types. Forty-nine of out of fifty murders. So the data is real, the data is frightening, and the numbers—just lastly, I’ll just say—in Europe are even worse. GOODSTEIN: Can I ask a question about the 57 percent number? GOODSTEIN: Does that include those? That was—were by a young man over in Israel. GREENBLATT: It does include those, so let’s talk about that just for a moment. If I normalized those numbers and took that out, it would be 43 percent. But we include them, and here’s why we include them. GREENBLATT: Because I don’t know, for example, who attacks a Hasidic person when they get punched in the back of the head in Crown Heights. And I don’t know who might vandalize a preschool with swastikas. I don’t know where they pray or how they affiliate. But I do know what it’s like, because I’ve talked with and my staff meets with the Orthodox community in Brooklyn, and I have met with the parents who have taken their children out of the preschools at JCCs, or the children who have taken their parents out of the rehab and exercise programs at JCCs. So I don’t care who causes the crime, how they pray, how they identify; I care about the victims. And when we’re dealing with hate we need to focus on that. What is the impact on the community that gets affected? And that’s why we consider each one of those a hate incident and we track it. BASS: Rebecca, let me ask you about one of the curiosities of the current scene today is the rise not only of anti-Semitism, but of this new wave of nativist populism and of a new energy on some illiberal precincts of the left. Is there some sense in which, this being a foreign policy organization, the rise of anti-Semitism is linked to a rise in anti-democratic politics globally? KOBRIN: I just want to—you want to talk to me about America and Europe? KOBRIN: OK. So this is something I just want to make as a statement, and we can probably disagree. But I think the issue of Israel and anti-Zionism surfaces differently in the United States than it does in Europe. And that is something that we have to just think about, that not all anti-Semitisms are the same. And in the United States what I have seen of the past two years is that it is directly linked to white supremacism and an understanding of American identity as related to race, not believing in certain ideals, and this rise in a certain type of racism. And as I said before, right, this was a candidate who ran on that Muslims should be registered and that certain asylum-seeking refugees who look a certain way are invaders. This is the rhetoric throughout the public discourse and politics, and anti-Semitism has to be seen as part of that. And I don’t think it’s a coincidence that Robert Bowers was animated in Pittsburgh by this fear of immigrants. It was not about Israel. And I think that that’s something that we have to just be thinking about, because I do think the right and the left do play—particularly in Europe in a very different way—but in the United States I see it as linked to this racist—this rise of racism, and understanding American identity as related to a certain racial identity by certain groups. GREENBLATT: Well, I think Rebecca brings up a really important rote. And I think from her position at Colombia University you see a lot, both from the scope of history and what’s happening right there on campus. While I don’t think you’re wrong, I don’t know that you’re right. KOBRIN: OK. I think that we have to think about violence. GREENBLATT: Well, and I would acknowledge, I don’t think you’re wrong, it comes in different forms. GREENBLATT: But I do think that what you often find in polite company, particularly on the left, is you will hear a kind of dialectic that goes something like this: Well, I don’t have a problem with Jews, I just have a problem with a Jewish state. I don’t think Jews are—don’t deserve to be here, but I think the Jewish state doesn’t deserve to be here. I don’t think that Jews have too much power, I think the Jewish state has too much power. I’m sure the Holocaust happened to the Jews, but the Jewish uses the Holocaust to blah, blah, blah. So you hear—I hear that kind of conversation. And so, again, I think it’s fair to say there are variants of anti-Semitism. It’s not all the same. And I certainly entirely believe criticizing Israel is just as legitimate as criticizing this country, or any other country. But very often what I see is a kind of de-legitimization of the Jewish state that used to be done against the Jewish people. And it bears unmistakable hallmarks of classic anti-Semitism. BASS: So let me—and we’ll turn shortly in the audience—but in the few minutes that we still have with the panelists up here before throwing it to your questions, let me ask one of the things that is weird about the current state of anti-Semitism, which is some of the diplomacy of the state of Israel has founded with strange bedfellows. You—Jonathan, you mentioned the deployment of tropes about George Soros as this sinister financier, echoing The Protocols of the Elders of Zion. He has been given something to a clean bill of health on many of these issues by Israeli diplomacy, that has been eager for the help of the nativist government in Hungary, in Poland, which has sometimes—which are governments that have sometimes been voting Israel’s way, or at least abstaining in some U.N. forums. You also have a strangeness that when many American Jews were feeling that the Trump administration—as Rebecca and others have expressed—was making American Jewish life less secure at home, particularly after the Pittsburgh massacre, the one public official who was standing to greet President Trump when he got to Pittsburgh was Ron Dermer, was the—was Israel’s ambassador to the U.S. Is there something—is there a divergence that is being exposed by today’s crosscurrents of anti-Semitism, in which the Israeli definition of what’s necessary for its security—President Trump who wants to rip up the Iran deal, potential new allies in Orbán and in the PIS government in Poland—those things that the Netanyahu government think help Israeli security are, in fact, things that American, and Polish, and Hungarian, and other diaspora communities think actually undermines their security? GREENBLATT: Who are you asking that question of? GREENBLATT: Way too far. No, it was really—it was really—it was almost inexplicable, because the data is real. And by the way, interesting kind of postscript on that, the diaspora ministry, his ministry, released a report last month on the state of anti-Semitism around the world where he actually admitted his error, because the data is real. 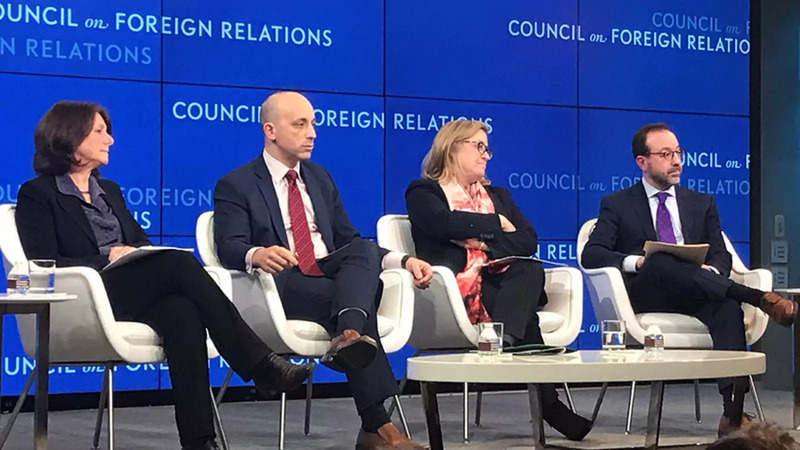 BASS: So the actual quote from Naftali Bennett, who was Israel’s minister for diaspora affairs, was: I’m not sure at all there is a surge in anti-Semitism in America. I’m not sure those are the facts. GREENBLATT: Yeah. He said that, by the way, less than a week after the massacre in Pittsburgh. So I think it speaks for itself. I don’t agree with everything the Israeli government does, whether it’s bringing racist parties into the potential governing coalition, or some of the statements they’ve made about the anti-Semitism here in this country, or some of the statements they’ve made about governments in Europe. And I feel very comfortable criticizing policies from the government because as someone who believes profoundly and deeply in the state of Israel, I think that’s part of my responsibility. BASS: I’m going to ask one last unfair question to Rebecca, and then I’ll turn it over to the audience. Which is, part of the—part of the strangeness of the landscape of anti-Semitism is an argument over the basic history that there was a Nazi genocide in Europe in the 1930s that killed six million Jews, because they were Jews. And what you are seeing today is what Deborah Lipstadt of Emory University calls a form of soft denial, particularly in Hungary and Poland, where these governments are attempting to rewrite the historical record to minimize the role that some members of their population played in collaborating with the Nazis in the Holocaust. Is there something particularly pernicious about this type of erosion, of attempts to chip away at the historical memory of the Holocaust? KOBRIN: I think the larger question to ask is the use of history that we’ve seen in recent years, and how history is being rewritten for certain agendas. And I would say this is across national lines. And we’re seeing in the nation that we’re in. The uses, and I would say abuses, of history. There are things that happened in the past. How we interpret them can change, but there are actual events that took place. And I think that this is interesting. I actually know Poland much better than Hungary. And what is happening in Poland is this rethinking of who they are as a nation. But for Poland, urban Polish culture of the 1930s is Jewish culture, right? This is—Jews made up 70 to 80 percent of many cities. So it is rethinking how you redefine yourself as a nation. And I think that that would be the way I would be thinking about what’s happening, because I don’t think it’s only happening in Eastern Europe. I think it’s happening right where we’re sitting today in the United States as well. GOODSTEIN: I want to—before you move on—Rebecca, you said something earlier that I wanted—that you disagreed with what I wanted to agree with. Which is the importance of the immigration issue. When you do spend time on these white supremacist websites, there is a—there’s a conspiracy theory you see over and over again. And then you see it kind of trickling up. And that is that Jews are responsible for turning this country non-white. Jews are the ones who want to import these immigrants. Jews are the ones who want to welcome refugees, because it’s a conspiracy to take back the country from, you know, the rightful white owners. You see it when—in the rhetoric about George Soros. What is the problem with George Soros? Well, many problems. He, you know, runs the world, you know. (Laughs.) But most recently, George Soros was funding the caravans, right, from Latin America across the border. Again, that’s that same—that’s that same conspiracy theory. And, again, that shooter in Pittsburgh, he talked, you know, online about HIAS. Now, who knows what HIAS is? Why did he know what HIAS is? The Hebrew Immigrant Aid Society. And the truth is that, yes, there are Jews in Pittsburgh who are working to resettle refugees. That is true. And this man latched onto this idea and, you know, talked about it with people online. And so this is part of why these—I think these—the anti-immigrant, anti-Muslim, anti-Jewish sentiment—these are all of a piece. They are all knit together. But I think it’s important for—to understand how these people are talking about Jews. And what it is—what the idea is that they have in their—in their minds. I’m not saying that you can reason with them, but I’m saying to unpack the conspiracy to try to understand why it is that they’re, you know, picking the targets that they’re picking. GREENBLATT: Can I just put a—underline that? So I think this is certainly correct. So for those of you who may have seen the video out of Charlottesville with those men saying, “Jews will not replace us,” what they are referring to is this white supremacist theory that Jews are driving for, quote, “open borders,” to replace—to commit white genocide, as they call it, to replace America, or as it looks today, with Muslims, and Mexicans, and other people—undesirables, they would put it. So that’s literally what they were chanting. And it’s interesting, because that was supposedly a rally about preserving Confederate statues. And it degenerated into Jews will not replace us. Anti-Semitism is absolutely at the core—at the core of these racist, xenophobic, anti-Muslim movements. You know, last year we did—we opened a center in Silicon Valley to look at this intersection of technology and hate. And we have researchers there doing great work around AI and machine learning. And one of the surveys that we did, or analyses, is we looked at Reddit to try to look at intolerance on Reddit. Reddit, for those who don’t know, is a very popular website and a very large kind of—like, a discussion board of sorts online. Fourth most visited website in the world is Reddit.com. What’s interesting about this is that we looked at—we wanted to look at anti-immigrant bias and xenophobia on Reddit. So we did. We did a statistically significant kind of sample and analyzed it. And what was the most frequent sort of hate term on Reddit in these anti-immigrant discussion groups? Jew. Which only underscores what Laurie’s saying. And the last point I would say, “caravan,” “open borders,” these are literally white supremacist phrases that have worked their way through the system and somehow landed in the talking points of coming out of the West Wing. So we should be careful about using these phrases, because we’re literally using the narrative of these hateful, disgusting people. BASS: One quick thing, and then we’re going to go to the members. KOBRIN: I just want to give this historical longue duree. So in 1919 the American Jewish Lobby, that’s what it was called, was about open immigration. And I’ve written an op-ed about this on CNN, so you can just look it up. But we take for granted the immigration quote system that’s first set in motion in 1921 and then set into law in 1924, as being just logical. But it’s based on racist assumptions of what America is, and what America should be. And who the newcomers were in those days, which were Jews, and Italians, and how they were corrupting America. And we’re stuck in the same conversation. This is the conversation, Jews will not replace us, that’s happening in Charlottesville. So it’s important just to be thinking about over the longue duree that this is a long conversation that America has been having as it sees itself as a nation of immigrants, but it keeps on thinking about what does that actually mean. And it is this struggle that America has. And Jews have been always, I would say, the targets, and at the forefront. And I should say that liberal Jewish groups still advocate for understanding the importance of immigration policy, because immigration policy is foreign policy. And I want to just say that we can talk about that. But the links between immigration policy and foreign policy are becoming evident as we talk about the—what the people coming from Central America, thinking about the way these are linked. BASS: So on that cheerful note, I will—(laughter)—I’d like to invite members to join our conversation with your questions. A reminder that this meeting is on the record. Please wait for the microphone and speak directly into it. Do I see one there? Please stand and state your name and affiliation. Please limit yourself to one question. And please make sure that the questions are, in fact, questions. BASS: Your name and affiliation, please. Q: My name is Cathy Gay, Catherine Gay Communications. Q: Well, question two is longer. (Laughter.) You all—you all are at the forefront in this realm. I need to hear some solutions, some actions that can be taken, that should be taken. BASS: OK, who wants to tackle the Women’s March? GREENBLATT: Well, look, here’s what I would say about the Women’s March. I mean, it was just over—it was just over a year ago when the ADL noted that two of the Women’s March—actually, three of the Women’s March founders, or the leaders of the movement—Tamika Mallory, Linda Sarsour, and a woman named Bob Bland, all feted Louis Farrakhan around his big annual speech in 2018, which was typically, you know, revolting, and anti-Semitic, and homophobic, and whatnot. Tamika Mallory was actually there. Linda Sarsour and Bob Bland limited themselves to praising his effusively online. And a lot has come out since then. And the anti-Semitic ideas that a few of these organizers had and, by the way, some of them continue to purport—propound. I think the Women’s March is an amazing, amazing movement. And I think this grassroots effort—which really exploded in 2017, the 4.2 million women who marched, it was the single-largest political demonstration in the history of our country. And the aims of it—equality, and pluralism—I mean, these are noble things that we all should laud. The problem is that some of the organizers simply have a kind of anti-Semitism which they seem impossible to deal with in an unambiguous, clear way. And so I think that’s very problematic. So, you know, the ADL doesn’t have an official position on the Women’s March. But we will continue to call out the anti-Semitism and the prejudice of some of those organizers. KOBRIN: OK. Do you want to talk about solutions? BASS: Anyone want to have a shot at solutions? KOBRIN: I mean, I’m going to give a historical perspective. What’s very interesting for me when I think about the 1930s—and there was an Oscar nominee for documentary about a Nazi—the German-American Bund rally, which was basically a Nazi rally in Madison Square Garden. But what was missed, and it’s missed in that documentary, there are more protestors outside Madison Square Garden—50,000 protestors outside Madison Square Garden—and 22,000 pro-Nazi in Madison Square Garden. So I don’t know if this is the solution, but what I have found interesting—and this is the comparison with Europe—is France is able to muster up in sixty cities protests against anti-Semitism, but there hasn’t been at the grassroots a protest against what is going on vis-à-vis anti-Semitism throughout the United States. And I don’t know if that is the solution, but for me it’s been interesting that that has not occurred. GOODSTEIN: I don’t—I don’t know if this is a solution, but I’ll tell you what I have observed. When there have been attacks on houses of worship—and that can be a Jewish house of worship, that can be Muslim, it can be Christian—and I have seen places where I thought a community might explode over that—or attacks also on people of faith, whatever that faith is. We have not—I have sometimes not seen a community fight itself because what has happened instead is that interfaith leaders—the rabbi, the minister, the imam, the—you know, the bishop—the Catholic bishop, who might in very many places throughout the country already have a relationship through their interfaith council and have—and know one another and sometimes have been working on local problems together. They immediately have a press conference, sometimes with the mayor, sometimes with the chief of police, in front of that house of worship. And if the house of worship has been damaged, if it’s—you know, if it’s a synagogue, then it’s the church saying: You can come worship in our space. And I think these interfaith relationships—I’ve seen this time and again—have kept the lid, at least in the United States. And I think also this has happened too, in—I’ve seen it happen in Germany and Sweden, right, some other countries. These interfaith relationships—sometimes it’s among the leadership. Sometimes it’s not, you know, in the pews, not at the grassroots, but the leaders having relationships with one another and goodwill with one another is—makes this a completely different era than, say, fifty years ago. And I think that’s maybe not a solution, but it’s something that I think is real, and that we don’t—we don’t hear about enough, because what we hear about is the violence. We hear about the hate. We don’t often hear about, you know, the quiet conversations. GREENBLATT: Cathy, I’m going to give you four quick answers, four quick solutions. GOODSTEIN: Oh, you would know the solutions. GREENBLATT: Number one, we need to demand that leaders lead—irrespective of how they vote. It’s about what they value. So whether it’s an anti-Semitic incident at your kid’s school or it’s an anti-Zionist thing at a college campus—some pro-BDS thing, or it’s something that involves the president of the United States. Whether it’s a president, or a university president, or a school board president, we need to demand that leaders lead and take this seriously, because when they speak out others listen. That’s number one—irrespective, again, of how they vote, or affiliate. Number two, we need anti-bias education. So the ADL’s one of the largest providers in the country of anti-bias anti-hate education. We reach over a million school kids every year. I want to reach 20 million a year, because I think education is the best antidote to ignorance. Number three, our police need to be prepared to deal with hate crimes effectively. That’s why we train 15,000 law enforcement offices from the FBI to the NYPD, all over the country, so they understand what’s a hate crime, how is it different than an ordinary offense, and how do you deal with the victims? And then finally on the cyber front, we need Silicon Valley to do more, and we need Washington, D.C. to wake up. So there’s a need for policy strategies in Congress, as well as product strategies, you know, from these big companies. BASS: Please stand and give your name and affiliation. Q: Yes. Cheryl Gould with Committee to Protect Journalists, as well as a retiree of NBC News. To what extent do you think that there is a problem within the Jewish community of those who are opposed to some of Netanyahu’s—you know, the state of Israel’s policies, whether it’s the settlements or what is happening now with his being drawn to the racist party. And yet, if many Jews call that out, they are called by other Jews as being anti-Semitic, self-hating Jews. And I think that that, you know, conflation of those two things is not helpful to the cause. And I was wondering, to what extent do you agree with that, that there needs to be a recognition that even within our own there has to be. GREENBLATT: Well, look, I would just anti-Semitism isn’t a Jewish problem, it’s everyone’s problem. I just want to say that right up front. So this may be a room predominantly Jewish, because we may have a greater interest in this than some other communities, but I do want to say that. Just like racism isn’t the black people’s problem. It’s my problem too. That being said, look, like, we’re Jews. Like, all we do is argue. We invented the idea of dissent, and disagreement, and commentary on commentary. So I don’t think that’s necessarily a surprise. But, you know, the Jewish—the American-Jewish community, 80-plus percent voted for Hillary Clinton last election, more so than any other ethnic—maybe it’s 78 percent- more than any other ethnic group. So there may be a minority who feels very strong on the right, but I don’t think we can characterize it comes from one place or another. BASS: Not that anybody should remember his name, just call him the Pittsburgh shooter. KOBRIN: Right. No, but the violent, or what’s happening Crown Heights—that that is one. Rhetoric is also important. There’s many ways to think about it. But when we use these terms, right, to be thinking about it in gradations or—I mean, there are some scholars, I should say, of Jewish history, who think anti-Semitism is a useless term, right, because it’s used to describe so many different things, right? Between 1919 and 1921 200,000 Jews are killed as part of the Russian civil war. And that was called anti-Semitic violent outbursts—200,000 Jews, right? So I’m just trying to say is that we use a word and we want to be thinking about how it’s used by different people in different times, and to think about what we should be concerned with, and what we should be more concerned with. BASS: Just got a microphone coming to you. Q: My name is Fred Claar (ph). And I’m an independent. I wanted to ask about intersectionality on college campuses. It seems that the students for—Students of Color Coalition, which is sort of run and organized by the Students for Justice for Palestine, which is the collection of minorities on college campuses, has become quite effective against Jews. Jews, being a minority, are not allowed in. And I just wonder about the application for that in society. I see—I see inklings of that now in the political parties. And I wonder about what you think about the success of intersectionality on college campuses in the future being an anti-Semitic event in society in general in the decades to come. BASS: Rebecca, you’re on campus. KOBRIN: So I think Colombia’s a unique campus. And I would say the coalition is about anticolonialism. So I want us to be specific. They are anti-Israel under Netanyahu, which they see as colonial, right? And that, I think, is something that we can be thinking about. But whether they are anti-Semitic, meaning all Jews, right? Against Jews per se as Jews, is the question that I actually don’t see so much on campus. The Israel issue is the issue. Whether—I hope I’m trying to be clear about this—I don’t think Jewish students who are observant of their Judaism feel threatened by this group, unless they are engaging about the issue about Israel. KOBRIN: And this is just at Colombia. GREENBLATT: Yes. So I talk to students, and parents, and professors, and administrators all over the country. And I would disagree with what Rebecca just said. Jewish students, whether they are pro-Israel or anti-Israel, there’s a reason why they are careful about where they wear kippah. There’s a reason why they are careful about putting mezuzah on their doors. There’s a reason why they are careful about getting involved in Israel activities. I’m not talking about going to the AIPAC policy conference. I’m talking about, like, Israel independence day on campus. And, look, some of this comes from Jews on campus who feel very strongly about this, let me be clear. But there is a rise of anti-Semitism on these campuses. And Israel may be what starts, but when there’s a BDS rally that isn’t about Bibi’s policies. That’s about the existence of the state of Israel. When the Students for Justice in Palestine hosted their annual meeting last November, as it was at UCLA, the fliers were a picture of a teddy bear, which is the symbol of UCLA, the bruins, with balloons. Now, why would they have the picture of the teddy bear with balloons last fall? Anyone remember what was happening on the border of Gaza and Israel last fall with balloons? Right, they were using balloons as incendiary devices. That wasn’t about the policies of Bibi Netanyahu. So anti-Zionism manifests as anti-Semitism in the real world all the time. And the last thing I would just say, when we have these anti-Israel rallies, suddenly there are swastikas on the Jewish fraternity, or swastikas on the Hillel. That isn’t about anything other than anti-Semitism. Now, that being said, intersectionality is a social theory about the interrelationship between different forms of oppression, the idea that in order to solve or even understand racism you need to understand sexism as well, you need to understand homophobia, and to recognize the way an African-American woman walks through the world you need to understand how those oppressions are intertwined and impact the way the way she sees the world and the way the world sees her. Intersectionality as a social theory is not anti-Semitic. But it has been misused by some to actually exclude Jews from certain conversations or suggest that only Jews of color can understand a particular set of issues that should be included in a coalition. So intersectionality is an abstract theory. The problem because when in principle it is practiced in such a way that intentionally excludes Jews. BASS: In the back. In the blue. Q: I’m Lucy Lang from the Institute for Innovation in Prosecution. And I wonder what you all think about the question of when the kind of crimes you’re talking about constitute hate crimes, and when they constitute acts of domestic terrorism. GREENBLATT: So I think hate crimes could be considered acts of domestic terrorism, very typically. A hate crime is a crime that’s committed against an individual or an institution based on an immutable characteristic, like race, or religion, or national origin, with the intent not just of harming the individual, but the impact of sending a message to the broader community. So depending on how one defines domestic terrorism, often you could consider these things to be interrelated. Like Robert Bowers, who was mentioned a few minutes ago. That was an act of terror as well as hate crime. BASS: Got a mic coming. Q: Joan Spero, Columbia University. You all mentioned at the beginning that the dark web, or the internet was playing—or, social media was playing an important role in the rise of anti-Semitism. And Jonathan said Silicon Valley has to be part of the solution. What should Silicon Valley be doing, and what should the politicians be doing? So we work with Google on using AI to try to interrupt cyberhate before it happens. We work with YouTube to have—to get them to change their algorithms, so it lessens the likelihood that a young person’s going to run into some of these anti-Semitic conspiratorial videos. We work with Facebook on trying to use a redirect method, so when you search for Holocaust as a hoax, you get directed to, like, Yad Vashem page. So there are different ways they can tweak their algorithms and adjust their products, so they think not only about free speech—not only protect the user’s right to free speech but protect the user’s right to not be harassed or hated. They have done some good things to deal with very specific cases by taking swifter action when people perpetrate online bullying or online harassment. Washington, you know, there are—there are—there’s a gap in the—in the legal regime. There are techniques that extremists have used online to terrorize Jews and other people—like doxing and swatting and other forms of cyber bullying—that are not covered by existing laws and need to be, because, you know, the school principal says, well, it’s not really bullying because no one has a bloody nose, right? But in fact the abuse online could be far, far worse than anything physical. So, you know, we need legislators to catch up, and to fill some of the gaps. BASS: Mic coming to you. Q: Thank you. Stephen Kass, Brooklyn Law School. I would like to ask each of the panelists whether you see any space at all between BDS as a policy position and BDS as anti-Semitism. GOODSTEIN: I’m not sure I understand the question. BASS: So, to be clear, this the Boycott, Divestment, and Sanctions movement which calls for, as the name implies, boycotts, divestments, and sanctions of the state of Israel. And some of the movement’s material suggests that the political end state they would like it to move towards is a unitary state, which is neither distinctively Zionist nor rooted in Palestinian nationalism, but would be a binational state, in which both communities would enjoy full civil rights. Q: Which is broader than my question. BASS: Well, that’s—I’m just translating it for those who don’t know the acronyms and giving my—and giving the panelists a moment to see if they can think of a way of having a swing at it. GREENBLATT: I appreciated Warren’s generous description. The architects of the BDS movement are opposed to the Jewish state of Israel—period, end of story. So in its design—if you believe that Jews deserve the same right of self-determination that all of the people on the planet do, including Palestinians, the idea that one would say that Jews don’t deserve the right of self-determination, I—when you—again, when you don’t afford Jews the same rights you would afford to other people, I think that’s anti-Semitic. And then—that’s number one. And so number two, I think it’s also safe to say in the way we see the BDS campaign, the tactics that they use, the things that manifest from it are classic anti-Semitism. And I alluded to some of it before when I talked about what’s happening on college campuses. So I think the intent of the architects and the outcome of the campaigns, absolutely, undeniably anti-Semitic. But here’s the thing, the notion of a campaign—a, quote, “nonviolent,” campaign to afford rights to an indigenous people, that sounds very compelling. The idea of saying, well, what we can do here to create justice—we can use the same tactic that we did in South Africa, that sounds very compelling. And so what happens is many young people, well-meaning people, get swept up in the idea that it’s a legitimate non-violent form of protest. And we should recognize that all the people who are involved in these efforts are not necessarily anti-Semitic. The college kids marching because they think this is a—you know, the in-vogue thing to do, they’re not anti-Semitic. But what they don’t necessarily understand is the intent of the architects and the outcome that it creates. And therein lies the challenge. GREENBLATT: Which the BDS campaign doesn’t support. GOODSTEIN: Right. But like I said, a movement is not a monolith. And so I think it’s—I just think it’s important to look more closely at the movement and its—and its variety. And it’s important too not to—not to tar everyone with one brush. It’s important to make distinctions between architects and those who are involved. Sometimes, you know, foot soldiers, and who may not be in—even in direct touch with one another. GREENBLATT: I think we’re in agreement. GOODSTEIN: I think so too, yeah. Mmm hmm.